Two color dbj, non repetitive images, electronic kms. Recently I began to be curious as to how long, non repetitive images might be handled when knitting on both Brother and Passap. The subject is not out of reach for punchcard knitters. In the early art to wear days when the options were for 24 or 40 stitch repeats, many artists joined punchcards in length to the desired height, and knit them in width + seam allowances, joining long panels together to form the large images, or hanging them as panels in tapestry format. One such artist was Nicky Hitz Edson. I have avoided working with such images since my bit knitter knit from screen days eons ago. Also, I always preferred DBJ variations on the Passap. I used the KRC function only in my very early Studio Electronic days, prior to acquiring the Passap or any of my Brother machines. Tools and machines available to me at present: 910 with EMS kit and Ayab software, old fashioned mylars also for the 910, an unknown capacity for accurate knitting “rehabilitated” 930 accompanied by img2track consultations for the moment with Tanya Cunningham, and Passap E6000 using technique 179. Reviewing some basics: the KRC function built into the 910 performs this separation automatically. It is the default dbj separation in Ayab, uses the built in KRC button with img2track on the 930. Repeats must be an even number of rows in height. KC I or II may be used, needle arrangements can vary depending on the look one prefers on the edges. The 930_940 directions get a bit more elaborate, and show usage of an accessory “latch opening tool” (I have never used it on my 910, may have to give it a test in the future); img2track downloads to the machine’s built in brain, the equivalent of downloading to the Passap console, which will hold the pattern program in memory until altered or erased. 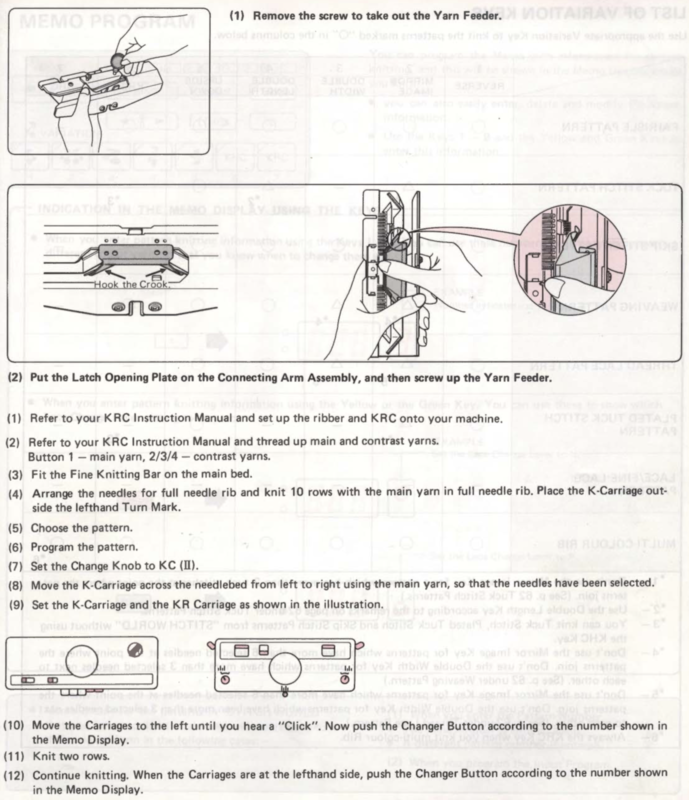 In re reading manuals I noted I have had a chronic habit since I began knitting of referring to the ribber “connecting arm” as its “sinker plate”. When the pattern selector is down, the pattern is centered on green #1 (right of 0). If the pattern is an odd number of stitches and the pattern limits are yellow 12 and green 13, the center is green #1. AYAB color sequence is reversed from the Brother convention of white pixels being color #1, and black pixels being color #2. It chooses black as color #1, white as color #2. The first pass to the right is set up with the “black” yarn. The first pass to the right preselects for the first row of black squares, which will be knit on the first pass from right to left. With an odd number of needles, Ayab places the larger number of needles on the left, its orange (yellow) side. 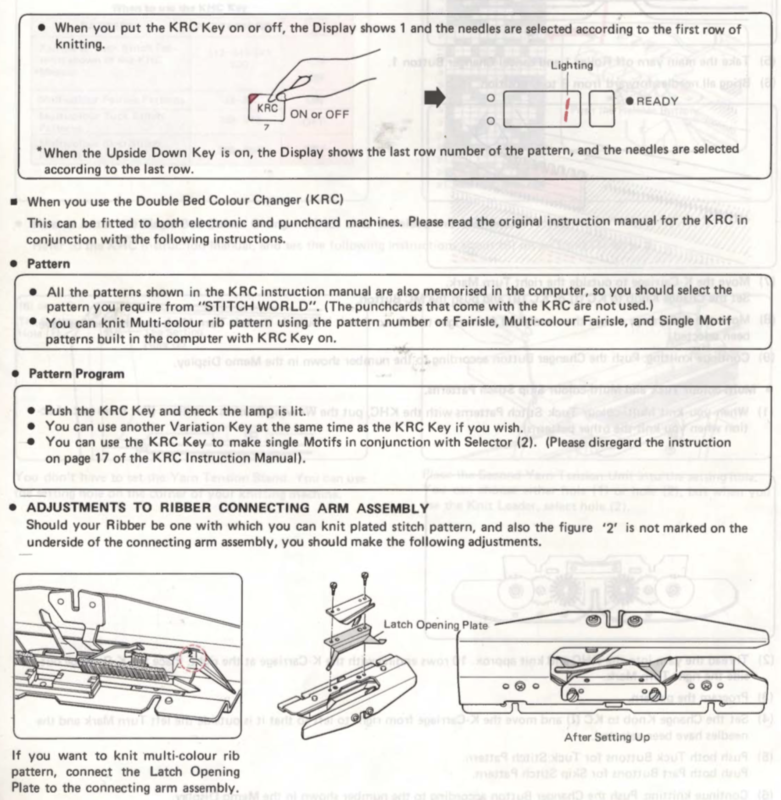 The closest relative to the KRC button in the PassapE6000 is Technique 179, intended for emulating single bed 2 color FI on Japanese machines, but it may be used with an every needle rib and varied back lock settings to produce far less elongated DBJ than its standard built in DBJ color separations. In single bed knitting GX/LX is used, for DBJ use every needle rib, and set back bed settings and pushers for desired backing (GX is the Passap equivalent of free pass, with the bed in that setting not knitting any stitches, whether or not any needles are in use or holding yarn). The repeat must be an even number of rows in height. The instructions in the company publications are that color reverse must be used, swapping the background and motif colors. The color changing sequence is the usual one. Both KRC and 179/ col rev knits white pixels first. 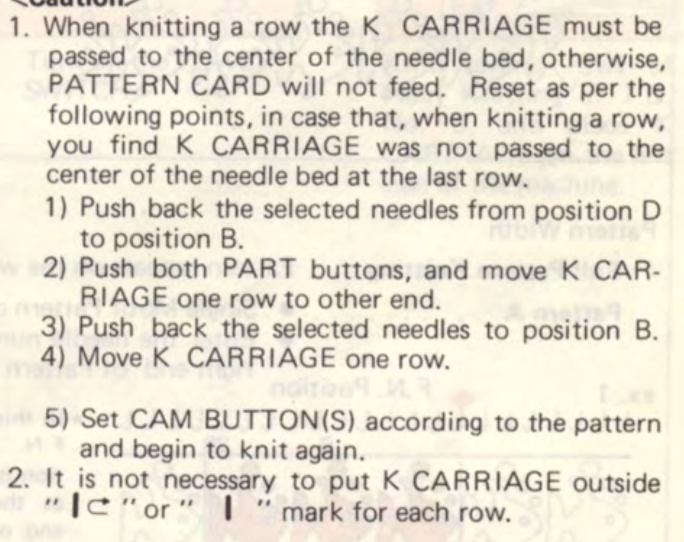 When knitting a row in Brother machines the K carriage must pass the center of the needle bed, or the pattern will not advance properly. 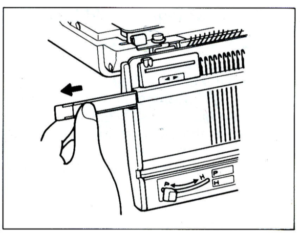 In Passap, programmed end needles for pattern on each side must be cleared or error messages will be received, and a pattern “correction” will be required before continuing. I am planning to begin by using a 2 color, large repeat factory mylar, scanned and reduced to downloadable image, details in how to in a previous post. 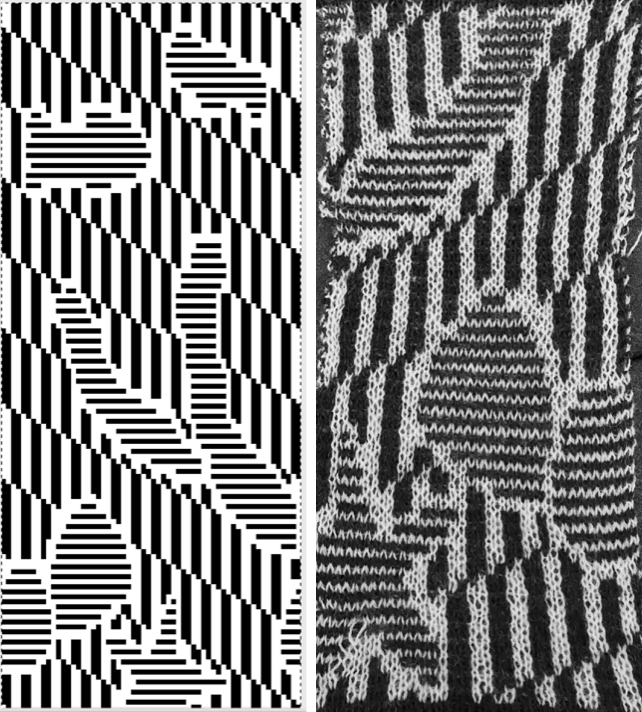 The goal is to knit segments that are part of a continuous, “longer” image. 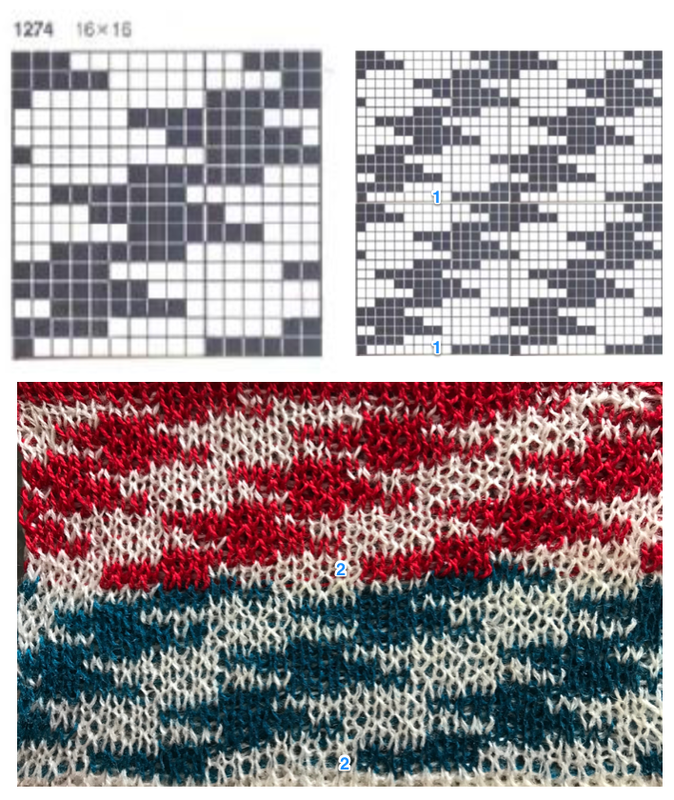 My ultimate goal: to knit scarves that are 70-84 stitches wide, with non repeating patterns for 12-1400 rows. My understanding that such an image in img2 track would be broken into tracks by the software, with each track programmed in turn as separate segments, and the software warning one when the last row for each track is reached. In Passap the segments will be entered as patterns A, B, and C, no warnings at repeat ends, they are calculated based on math. Segments will be 30 pixels in height as “pretend” longer file components, for the sake of knitting speed. 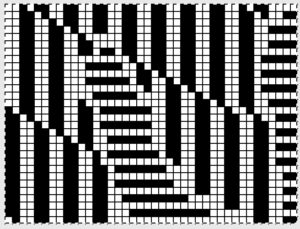 The problem comes at the intersection of the 2 different patterns; the assumption with the KRC separation is that you start with one row of color 1 opposite the color changer, and if you are knitting a continuous, “looping/repeating” pattern, the last rows knits the last row of color 1 away from the color changer (B), and will start with row 1 color one again toward the color changer on the left in Brother (C). 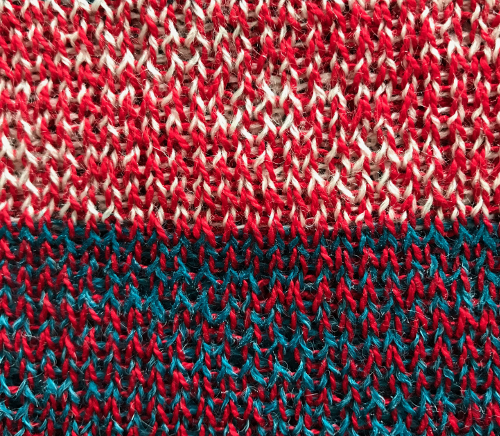 One approach is to stop knitting in pattern opposite the color changer, (red line), program the second piece of the “longer” design, and start to knit the first row of color 1 again for that pattern segment, going from right to left/ toward the color changer(C). Color changing then follows every 2 rows until the top of the second pattern piece is reached, repeating as needed. One develops preferred ways of handling images as knitting experience increases and varies. I have always done my own scaling prior to any actual knitting. 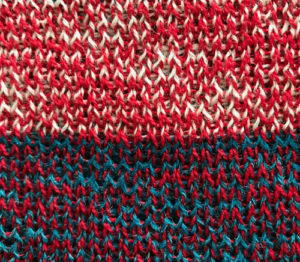 Software programs at times offer to adjust height based on knitting technique and either real or estimated gauge. Passap has a smooth edge feature to decrease stepped effects if the image is enlarged in multiples by the console. 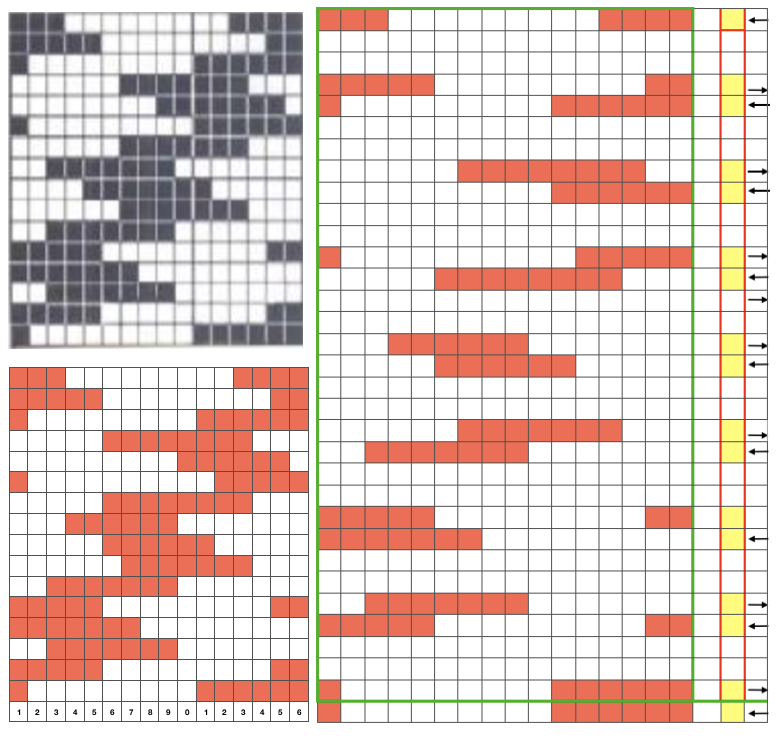 In double bed work, sample swatches are often much larger than when working single bed, at least 100 stitches by 100 rows. 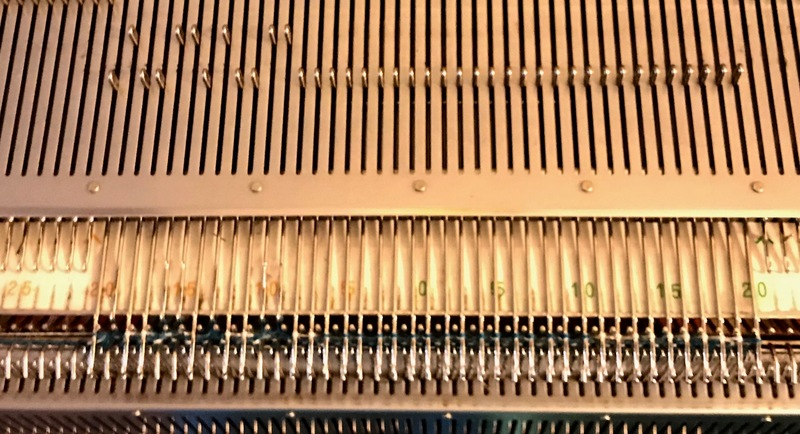 Because DBJ lengthens the image by default (each single row of design now requires 2 passes of the carriage), a separation for a 30 row design would require 60 rows of knitting on the machine to complete the repeat. Ribber settings can help reduce elongation in addition to any scaling of the motif. One alternative would have the ribber knitting in one direction, slipping in the other. This means that every other rows the main bed will create floats for the non knitting color, get caught between beds on the next pass. 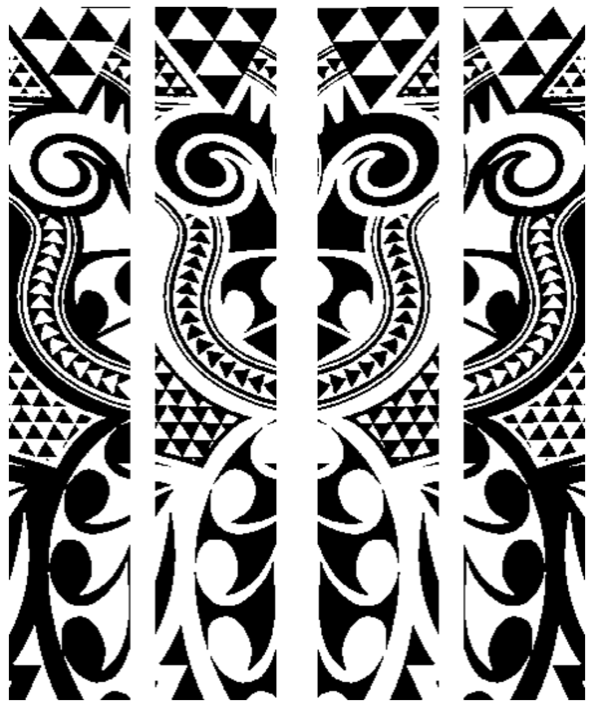 In my test design such floats are quite long in sections of the motif, resulted in problems, so that left me with choosing the lili setting. Lili buttons on Brother machines behave like a 1X1 punchcard does on the main bed. There is no free pass with ribber set to slip <— —> if lili buttons are engaged. It is the equivalent of making such a pass on the main bed with every other needle selected, where any stitches on selected needles would be dropped if there is no yarn in use. 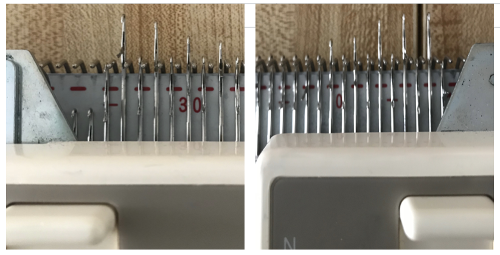 Also, one may not slip on the same needles continually, so needles in use on the ribber must total an even number, in pairs of what I refer to as dash and blank or blank and dash markings on the needle tape. The pusher selection on the Passap selections operates differently, so an even vs odd total # rule doesn’t apply. The knit carriage is now brought to the left, set to slip <— —>, KCI or II, in proper placement outside the turn mark for the first preselection row to right. Make a free pass to right, needles will be selected in pattern for the first single row of white squares (needles on the main bed after cast on are already only in B position). Place the yarn properly in feeder, couple the carriages, knit right to left, change color every 2 rows. 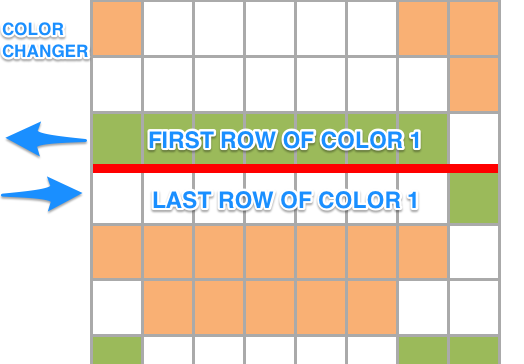 At the row before the last row of the pattern (top row, color 1), the card is automatically returned to the starting position of the pattern. When the machine buzzer alerts with its sound that the end of the repeat is being reached, the contrast color 2 (black squares) will be on the right side. In my initial attempts I used the approach: knit to left, change to white (color 1), knit a single color 1 row left to right and stop. Do not cut the yarn. The next pass to the left needs to knit the first “white squares row” in the next segment. The ribber carriage remains on the right, the birds eye pattern on the back will not be interrupted. I took the knit carriage off on the right, moved it back to the left side, it will not be holding any yarn. Prepare for knitting the second segment. There will still be needles selected (they would have knit the first white row when moving from right to left if the repeat were a continuing one). They need to be manually pushed back to B or those stitches will be dropped on the free pass to right. Program as usual, pre select to right, place white yarn back in proper position in feeder, engage both carriages and knit repeating the process until once again, a first, single row of the white is knit at the top of the second segment. The machine sounds serve as reminders when you have reached the point where things require attention. The process is repeated until all necessary pieces have been knit, composing the much longer image. As I worked further, I believe the same method may be used as seen below with the mylar in place. Knit the last row with the ground color to left, preselection for the white squares is made on the way. Do not disturb needle selection on the bed or settings on either carriage. COL. Program the next segment, begin on far left outside the turn mark, change color to color 1 (white squares). As the carriages move to the right, the last row of segment one knits and the first row of segment 2 is preselected. As the carriages return to the left to begin color changing sequence every 2 rows, row 1 color 1 segment next will knit, while the first row of the ground (black squares) will preselect. Here I attempted proof of concept with img2track on my 930 which is nice enough to track rows knit. 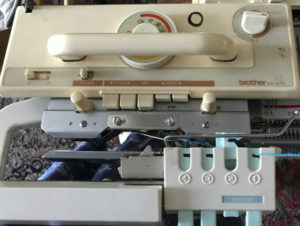 As the top of the first segment was reached and the carriage began to reverse direction from the right, the machine made a warning sound, alerting me to the fact that the second row for row 30 of color 2 was about to be knit as the carriage moved back toward the color changer selection was made for the last row of color 1 making certain I did not disturb the needle selection in that row, I took the carriages to the far left, programmed the second segment in the repeat, with not other changes to carriage settings, changed to color 1. 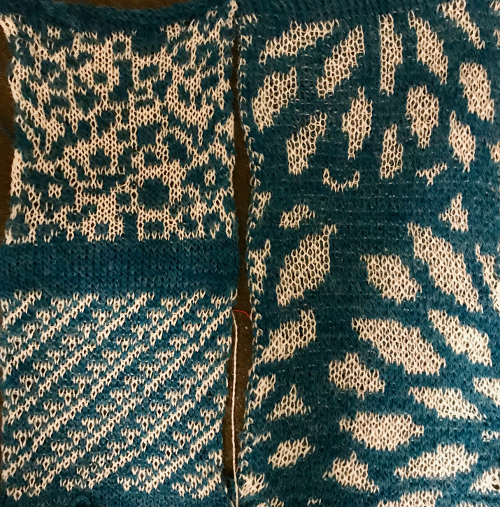 The above row knit on the first pass to the right with color 1, while the preselecting row 1 for color 1 in the new segment and knitting it on the return to the color changer. The idea appeared sound, but then I ran into this: random dropped stitches. At first I thought it might be a yarn issue (different fiber content and weight). After a break I took time to check all ribber adjustments, since this deconstruction was not part of the plan. Adjustments in ribber height (dropped a bit on each side) appeared to solve the problem. 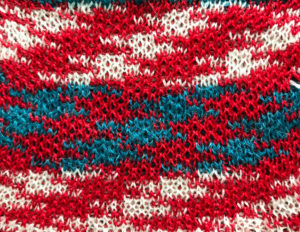 I began the swatch intentionally with plain knit stripes as an initial check, switched color 2 to the other yarn to test any different behavior there as well. I had actually moved my ribber from my 910 to the 930 without checking alignment and spacing after doing so, lesson learned. I cannot speak for img2track from personal experience. When I posed the question to the FB group as to how the program might handle a long, non repetitive image, I supplied the image above. 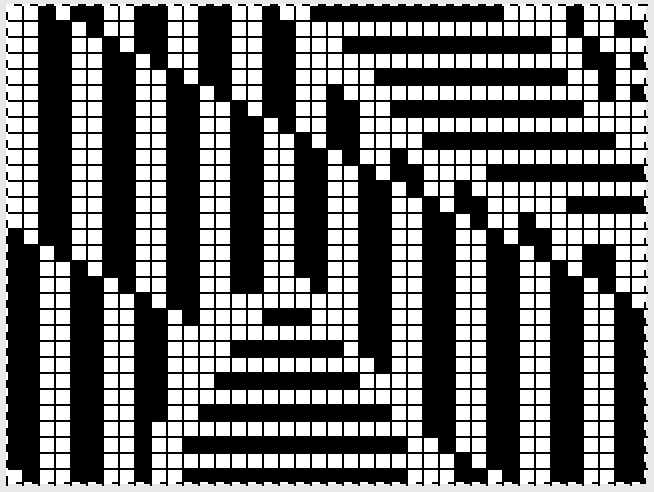 It is not knittable as is, 103X841(odd#) rows, from a random illustration found online that would need a lot of “clean up”. Assuming it was knit ready, an even number of rows, and other DBJ set up requirements are met does the 2 color separation work for the whole image length or must the image be divided into segments that are in turn knit and color separated separately? Tanya Cunningham, creator of the group, was kind enough to respond in the forum, and I have her permission to share her response here. “Img2track creates a B&W pattern of the full length of the image. THAT file is useable in other applications. Many people create an image file with img2track, then load that image file into DAK to knit. Img2track does NOT create separate image files for the various tracks into which it breaks larger images. That happens when you request the pattern from the machine console. When img2track receives the request from the KM, it offers all tracks, and you select which one you wish to load. This image is already in a format such that it will not be altered by img2track (.bmp) (unless you restrict the width.) 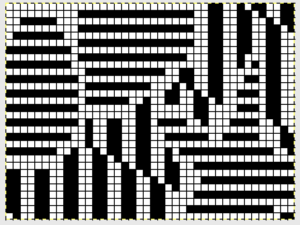 I selected it with img2track, and the resulting “pattern” was basically the identical image, just converted to a png. I put the same query to participants in the facebook Ayab group. 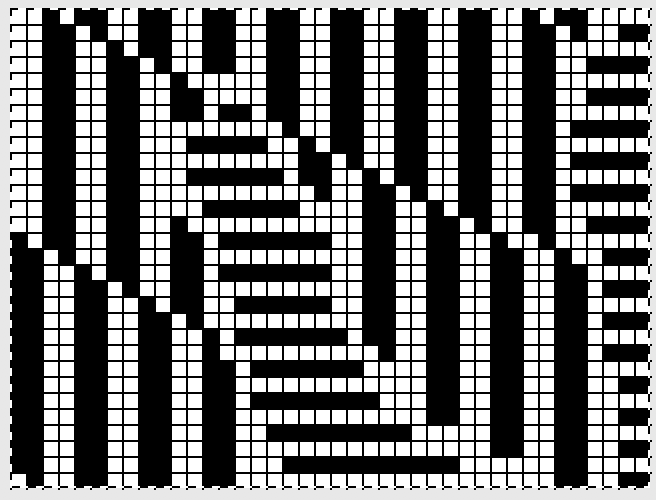 Ayab knits from screen, so providing there is no interruption in power it appears some users are able to knit long, non repetitive images without any sub divisions of the original pattern. Adrienne Hunter, an expert user and great resource offered the following information: “there’s effectively no length limitation in AYAB; the Arduino requests the next row as soon as it has finished selecting the current row, and the computer keeps sending the next row (color-separated as needed) until it reaches the top of the file. The pattern is in your computer’s memory which can be considered to be infinite; unlike a download to a 1980’s self-contained knitting machine with very limited on-board memory. As you say, the computer must be set to stay awake, and as always you need to consciously wait for the beep on the right; the time it takes to do the color change is generally enough to cover the delay on the left. I see occasional patterning errors in long narrow fair isle pieces too, but not in DBJ. That’s because the errors can be prevented by crossing a turn mark every now and again, and with DBJ you cross a turn mark every two rows when you enter the color changer. You’ll see the annoying UI bug where the display jumps back to the beginning of a long item so it isn’t showing you the section where it’s actually working. 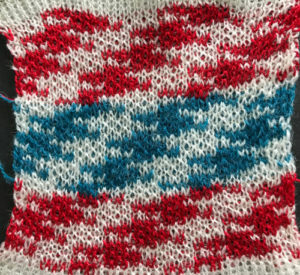 The knitting is doing the right thing, just not scrolling the display correctly to show it to you.” If accurate for the full image, this appears to be the ideal method to me. 9/16/18 I received an orphan 930 which when first received had no movable parts related to patterning. The belt was frozen in place, and when that got liberated after cleaning and lubricating as much as I dared take apart at the time, after some initial errors the built in patterns from several groups including lace knit perfectly, with only a slight squeak. After being stored again for a while, I tried built in FI patterns again, and they displayed errors. 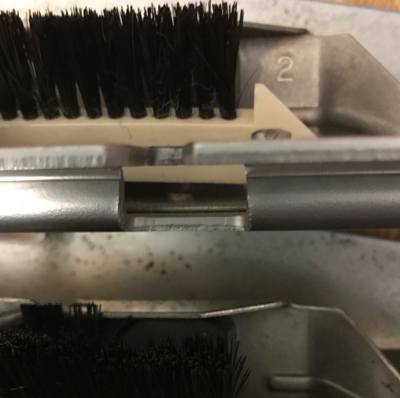 I heard a new noise coming from the needle selector, exposed that, cleaned and lubricated it, and it lost the added noise during operation. Tried built in FI with resulting patterning errors once more. That said, test patterns in the service manual 881,882,884 knit perfectly. After another break for both of us I got some built in patterns to work again both single and double bed and put working with them to rest. I began to work with img2track. I have not yet purchased a key. These were my first self drawn single bed and dbj tests, none intended for any final piece. 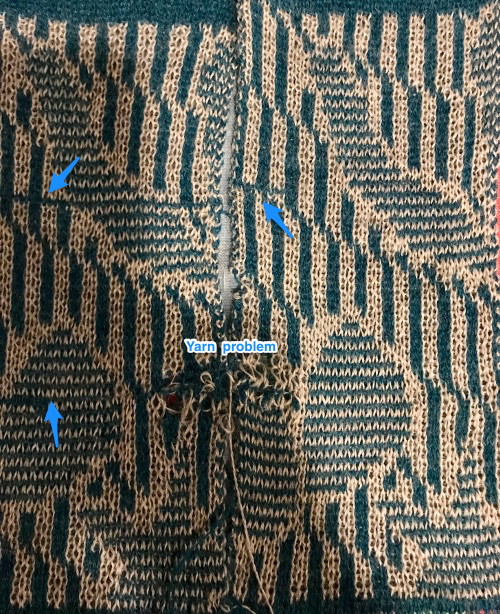 Here a quickly drafted long, narrow test design is shown with the first track self repeating on the bottom, then with the second track programmed, and continuing on after the first (thanks to help and feedback in the FB group; long stitch striper backing and dropped stitches = extra “design features”😉. 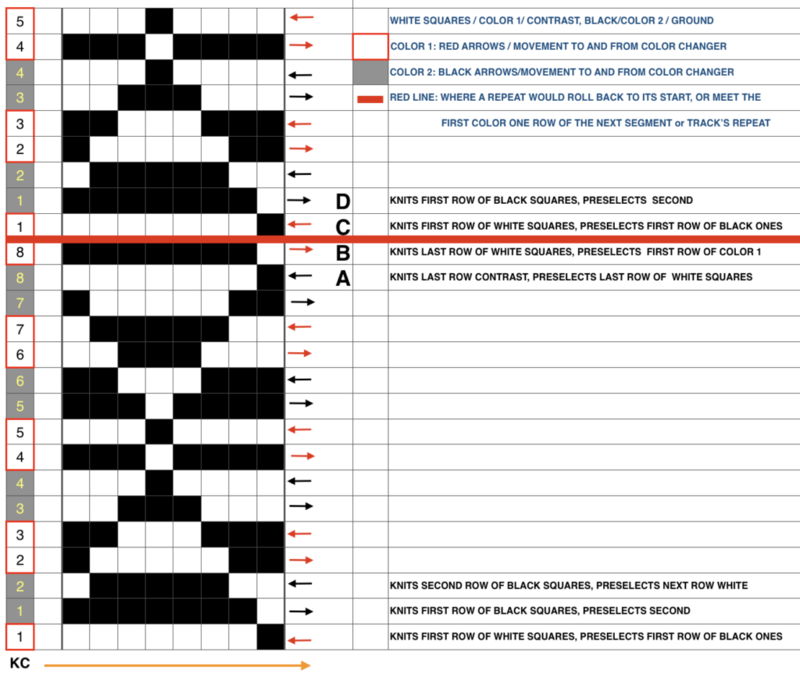 The program makes a sound when the last row of ground (black squares) is reached. The carriage is then moved to left, knitting that last row of ground while selecting last row of color 1 for that specific track. When on left, begin outside the turn mark, program the next track, change to color one, remember to set for KRC, knit to right (Cam button will already be set for KCI orII). As you do so, the last row of color 1 is knit, the first row of the next track for color 1 will be selected. The latter will knit on the way back to the color changer. Continue in pattern, changing colors every 2 rows. Knitting is uninterrupted by having to change carriage settings on either bed, backing pattern is also uninterrupted. 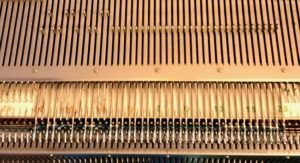 “The KH-930 takes just a few seconds to load the track, because the memory holds only 2 KB of data (about 13000 stitches). Later models have a much larger memory (32 KB). The KH- 940 and KH-950i require 42 seconds to load a track.” “If your pattern was divided into more than one track, you will have to load successive tracks when completing the previous track. 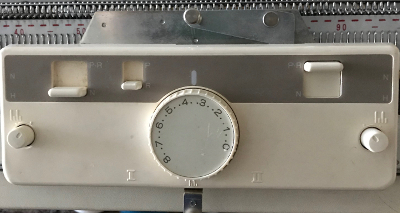 Listen for the beep from the knitting machine, indicating that the carriage is about to knit the next to last row of the track, selecting needles for the last row of the track. 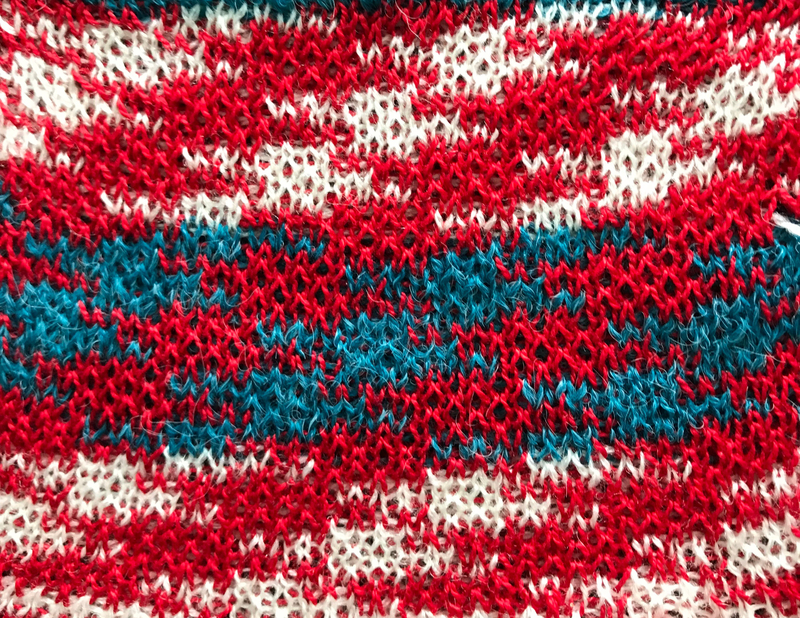 Knit this second to last row, and then STOP. 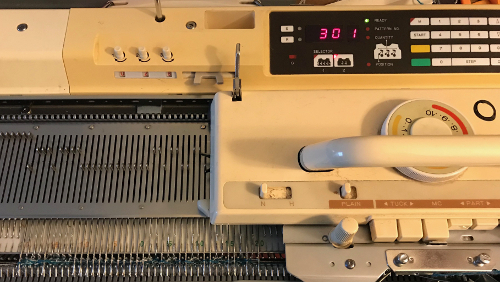 (If you simply continue knitting at this point, the knitting machine will knit the last row of the track and select needles for the first row of the same track). 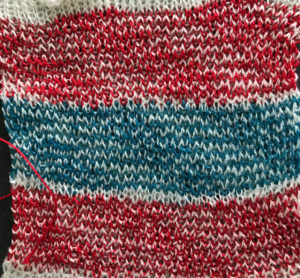 To load the second track of the pattern, enter CE 551 STEP, and then 2 STEP prior to knitting the last row of the current track. (If your computer goes “to sleep” while you are knitting, you will be unable to load additional tracks. Be sure to check that your computer is not “asleep” before attempting to load successive tracks.) 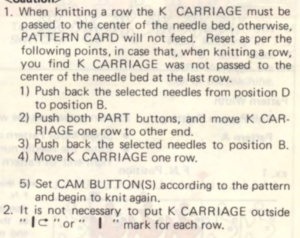 Before you begin to knit the last row and select needles for the first row of the next track, be sure that the carriage passes outside of the turn mark. 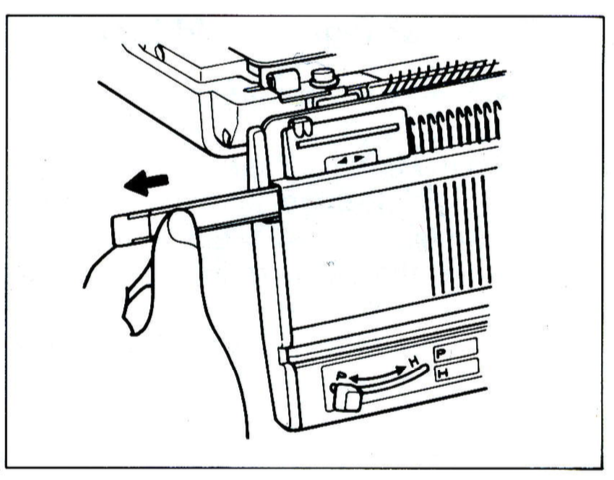 The knitting machine will retain the loaded track in its memory until you alter it. You can turn it off, and later turn it on and resume where you left off.” So what about Passap and using it for emulating the KRC 2 color DBJ? Passap color changer to start with, is on the right side rather than the left. All preselection of pushers (they will in turn drive the needles to move into work or not) always starts from the left. The first pass to the left after casting on and the pattern is programmed brings them all into work in a flat line, the first preselection row is left to right, with color changes following every 2 rows. Settings for those 2 rows can vary, the console guides you through supposed 2 free passes with settings at SX/GX, the equivalent of Brother slip <– –>/ slip <– –>. The technique 179 is intended for simulating single bed FI in Japanese machines, the manual recommends color reverse. In DBJ that would line up with KRC selecting white squares firs. I like thinking of my black squares as my pattern ones, so I tend not to use the color reverse, choose my contrast color accordingly. 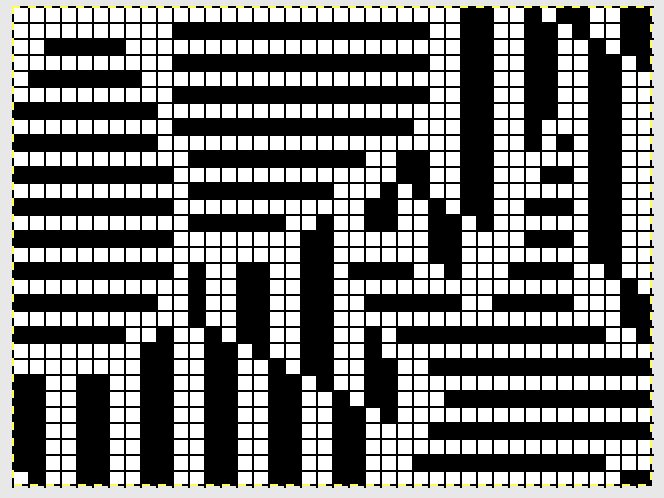 I decided to program the same built in pattern twice, as A and B, each using tech 179, a repeat in which I thought it might see easily what happens when the “2 separate segments” intersect. 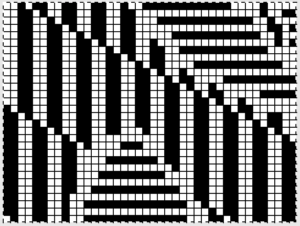 Below is the pattern seen in B/W, tiled, and knit. 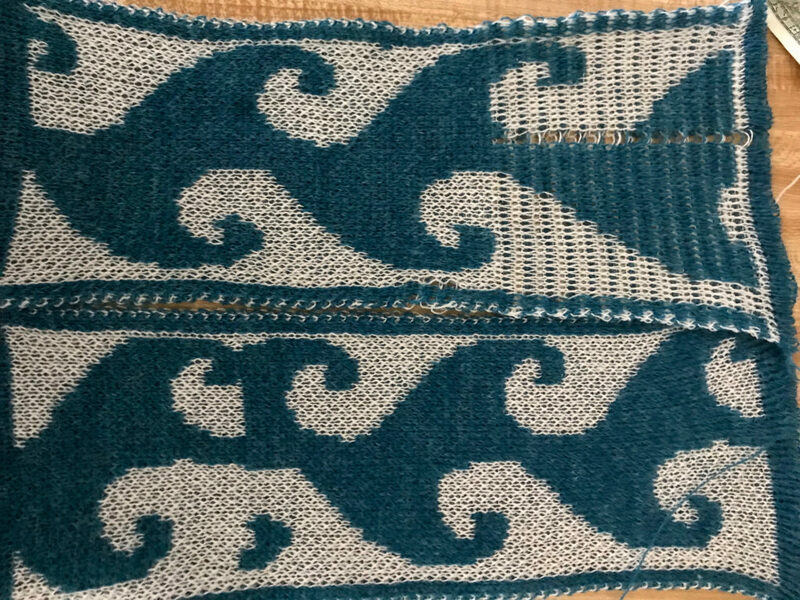 Notice in the knit swatch the first row in each sequence repeats twice. 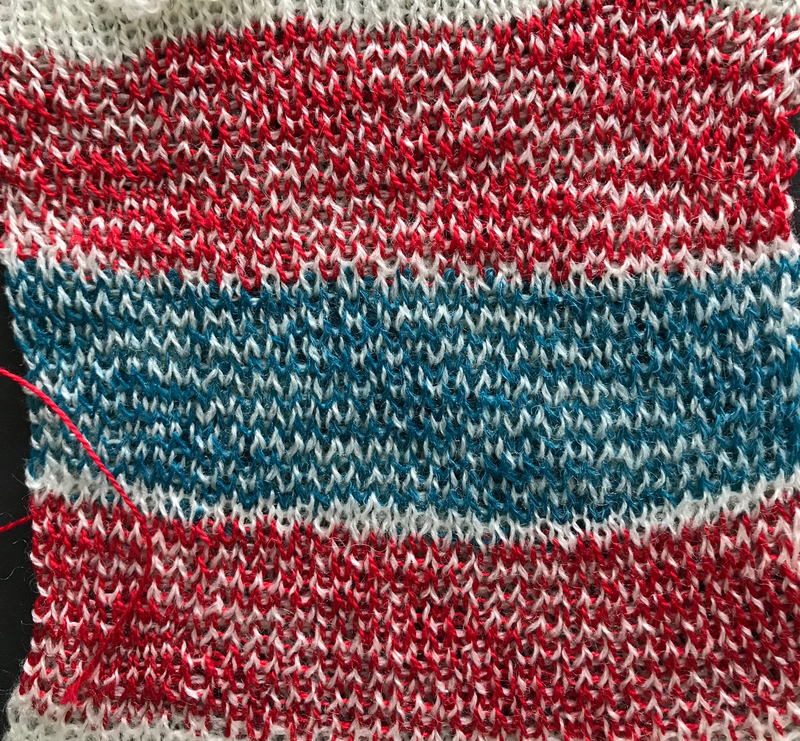 What appears to be happening, is that only that very first row is repeated twice for one time in the color separation at the very beginning of the knit. The arrows on the right indicate movements of the locks to and from the color changer, knitting my black squares. 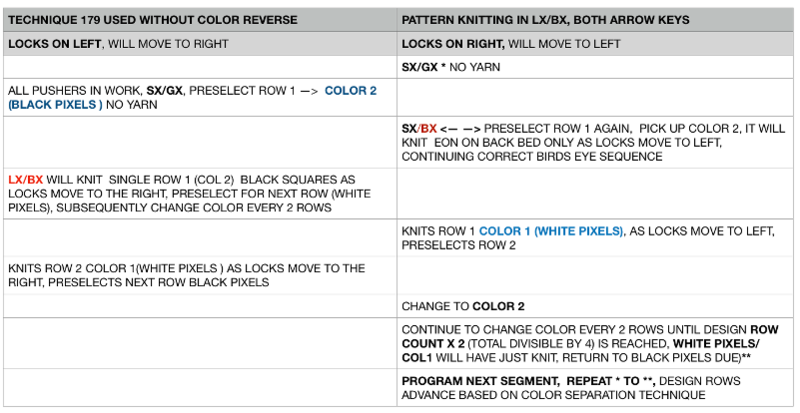 If row one is knit in that that color twice only once, and the pattern subsequently is kept continuous, rolling back to row one for only a single pass, the 2 row color rotation can be maintained. The bold, green border outlines the single, full repeat. The separation is only for illustration of placement for the one color. 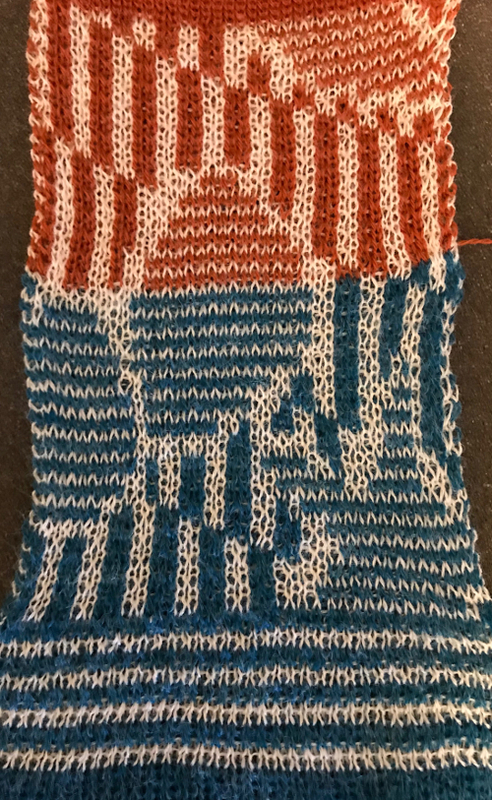 Swatching again with an attempt to produce it as 2 separate but continuous segments: I do not use color reverse, choose my color to match black squares, and that would be color 2 on the console prompt. In my firs attempt I followed other usual console prompts, but used SX/GX settings for three rows rather than the 2. The first pass will lift all pushers into work. Second pass preselects pushers for first row of pattern to right. Third pass would normally knit the first row of pattern, preselect for second row to be knit from left to right, and so on. After the third SX/GX pass the locks are on the left side(LOL), I changed settings for pattern knitting (LX/BX). On the right, made certain the empty yarn holder is up for the next color. On the left yarn into eyelet, making certain it was positioned so it would not be crossing other color yarn on travel back to color changer. Knit single row to the right, changed color, continued knitting in pattern unit the top of the “segment” was reached (row countX2, in this instance = 32). The design color knit its last pass, locks are on right (LOR) Programmed second segment, repeated 3 rows of SX/GX. On left, yarn in feeder, proceed as above. This gave me correct continuous segments on the knit side of the fabric, but the birds eye backing was disrupted. On the bottom because of operator error in lock setting, and the top because birds eye normally knits EON for 2 rows, creating a bit jaggy, single line of color after knitting on all needles when the second pass is knit, while here it EON for one row only, missing that second pass. Note yarn ends, yard would need to be cut to position it for those single row passes from left.